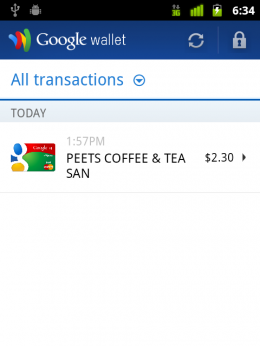 Google Wallet – Poised to Dominate Payments? At last week’s Sprint Open Solutions Conference I got my first look at Google Wallet, the search and advertising company’s mobile payment system. Wallet is the first large scale mobile payment system released to the general public in the US. Here’s my take on how it works and what it means. The Samsung Nexus S 4G on the Sprint network is the first, and so far the only, phone that works with Google Wallet. It contains an NXP PN65 NFC chip which incorporates the NFC receiver, transmitter, radio controller and microprocessor as well as an embedded “secure element” which holds encrypted digital copies of the user’s credit and debit cards. The entire payment transaction is controlled by the NXP chip independently of the phone’s OS and CPU. Google Wallet currently works with point of sale terminals which support MasterCard’s PayPass contactless credit and debit cards. Millions of PayPass compatable cards have been distributed since the program launched in 2005 and today over 300,000 US merchants accept PayPass, including most Radio Shack, Home Depot and MacDonalds locations. Getting started with Google Wallet is pretty straightforward. You launch the Wallet app on the phone, set up a four digit PIN and add your cards to it.Currently the only supported cards are certain CitiBank credit cards, a Google Prepaid debit card and rewards cards for Foot Locker, Champs Sports, Guess shops, OfficeMax and American Eagle Outfitters. Unless you already have a supported Citi credit card the Google Prepaid Card, which is available instantly to anyone with a Google account, is the fastest and easiest way to start using Wallet. Google even gives you a $10 credit when you activate the prepaid card. You can top up the prepaid card with any credit or debit card from with in the Google Wallet app on the phone. The minimum top up amount is $20. 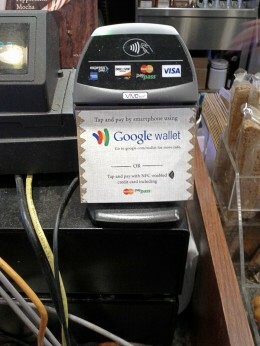 To pay with Google Wallet you wake the phone up and tap it on a reader at a merchant. It’s not necessary to launch the Google Wallet app. However, the Wallet requires a PIN to unlock and only stays unlocked for a user specified time of 1 to 30 minutes. If the Wallet is locked when you tap to pay the phone will prompt you for your PIN. It took me less than five minutes to set up Google Wallet and the Google prepaid card. I tried it at Peet’s coffee shop. The first time I tried it didn’t work, probably because I didn’t hold the phone on the terminal long enough. You need to hold the phone on the reader until you hear a beep. Will Google Wallet be a success? Hard to say but I think it does have a very good chance of becoming a major mobile payment system in the US and the world. I first encountered contactless mobile payments in Japan five years ago. I saw people opening a transit fare gate or buying a cup of coffee, newspaper or groceries by waving their phones over a terminal. I came away thinking that paying with your phone would eventually become the norm everywhere. The appeal of mobile payments is not so much that it’s easier to pay by tapping a phone than it is by swiping a card, because it isn’t.The real power of phone based payments is that the phone has the processing power to hold and manage all of your current credit and debit cards, merchant loyalty cards, transit fare cards, keyless entry cards as well as coupons and Groupon style offers. Instead of fumbling through your wallet for the right card you would just tap your phone on a reader to make purchases, open fare gates and the doors at your home and workplace. Sine my Japan experience,I’ve witnessed numerous US mobile payment trials that seemed promising but went nowhere.I think the problem is the various players haven’t been able to agree on how mobile payments will work. Payments are potentially an extremely lucrative business. The banks, mobile operators, credit card networks and alternative payment networks like PayPal and Western Union are all trying to position themselves to get a piece of the action. Not surprisingly, no agreement or standard for mobile payments has emerged. Contactless payment took off in Japan because a huge entity, the national railroad system, adopted a particular scheme (Suica which is based on Sony’s Felica RFID technology) for contactless fare cards. As virtually everyone in urban Japan commutes by train, Suica cards quickly came to be carried by millions, establishing Felica as the default standard, which was adopted by Visa Japan, JCB and other payment networks. Since 2006, Felica chips have been built into most Japanese phones and mobile payments have become commonplace there. In Sprint Google found a nationwide mobile operator willing to work with them. 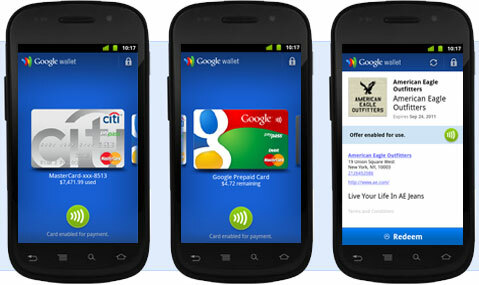 Google and its partners have created the first large scale nationwide mobile payment system in the US. In tech, being first doesn’t always guarantee success, but it often does, especially when the intial implementer has the resources to aggressivly promote and continually improve their product and Google certainly has both. The main things I see as holding back Google Wallet adoption are that it only works on one phone on one operator and that not enough merchants accept it. Although 300,000 participating merchants sounds like a lot, my local grocery store doesn’t take PayPass and neither do any of favorite cafes and restaurants. For Wallet to really take off it needs to be supported by the majority of merchants. Google and FirstData are doing their part with a program to give small merchants a free NFC reader and $100 of free transaction processing. In addition Google isn’t charging any transaction fees at all. Merchants pay the same processing fee as they do for conventional credit card purchases and Citi, MasterCard and FirstData collect their normal fees as well. Google plans to monetize Wallet with advertising and merchant fees from Google Offers, which is integrated with Wallet. Google is touting Wallet as open to everyone involved with electronic payments and transactions including; banks, credit unions, transit operators, payment processors, credit card networks, mobile operators, NFC chip makers and handset OEMs. Visa and Google have signed an agreement that will allow Visa Cards to be added to Wallet and negotiations are underway with additional banks and credit card networks. Although Google has Sprint, getting other operators on board may be a tough sell.The other US national carriers (Verizon, AT&T and T-Mobile) have created a joint venture called ISIS which has announced agreements with Visa, Mastercard, Discover, and American Express. As often seems to happen with joint operator schemes, ISIS seems to be slow out of the starting gate. The ISIS program began a year ago but is not yet operational. ISIS is scheduled to begin its first trial by mid-2012 in Salt Lake City. At that rate I can’t see ISIS general availability for at least a year. By then Google could have an insurmountable lead. I’m interested to see what happens when the next pure Google Android flagship, the Galaxy Nexus, lauches Nov 21st on Verizon. It is said to contain the same NFC payment chip as the the Nexus S. The big question is if Verizon will allow the phone to use Google Wallet. If they do I think ISIS is dead. 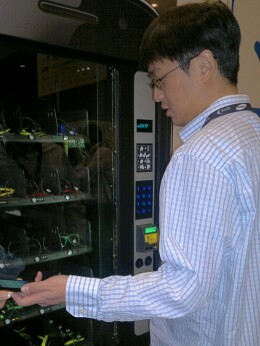 At the Sprint conference, Google had a large and very popular exhibit area on the show floor promoting Google Wallet. 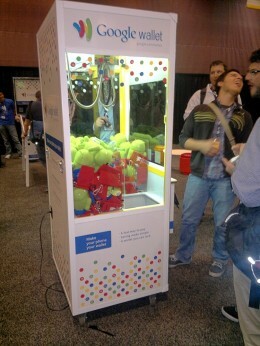 The booth’s draw was a vending machine where you could “buy” free Google swag using Google Wallet and an insanely difficult game with stuffed Android robot mascots as prizes. Both had long lines whenever the show floor was open. Disclaimer: All attendees at the Sprint Open Solutions Conference, including myself, received a free Nexus S 4G phone and a month’s free Sprint service. This entry was posted in Mobile Payments and tagged Galaxy S 4G, Google Wallet, NFC, SprintOSC2011 by Dennis Bournique. Bookmark the permalink.